Shop online for over 1,100 n scale model train passenger cars at discounts up to 46%. 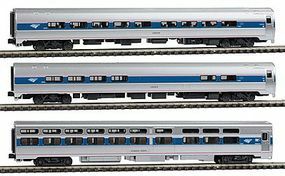 Con-Cor is ranked #1 out of 16 n scale model train passenger cars manufacturers, followed by Kato USA Inc, and Rapido Trains Inc.. This is the N Scale US Army Standard Passenger Coach Car from Model Power. This is a bookcase-style car set containing three individual cars, with the capacity to hold a mix of up to four additional cars or locomotives (7 spaces in total). Modelers can choose to use the extra space to store the contents of the P42 Amfleet Viewliner Intercity Express "Starter Series" set, or a selection of individually released coaches and sleepers. This is the N Scale Heavyweight Observation - Ready to Run - New York Central (gray) from Model Power. Suitable for Ages 14 & Older. Baggage cars are a necessary part of any mid-to-long distance train as they provide room to store passenger luggage. Acquired by Amtrak in the 70's, many of Amtrak's heritage baggage cars are older than Amtrak itself - a tribute to their rugged construction and continued utility. Delivery of the original Superliner 1 cars began in 1979 with the first cars operating on short runs originating in Seattle and Chicago. 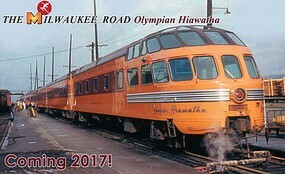 As more cars arrived, entire Superliner trainsets replaced trains on existing Western routes. The height of a Superliner generally precludes its operating in the Northeast because of tunnel clearance concerns. 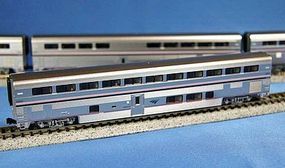 The Phase IVb is the current operating paint scheme for Amtrak passenger equipment, removing the "SUPERLINER" lettering from the sides of the cars and featuring the new Amtrak logo on the sides of the car. This is the N Scale 72' Smooth-Side Baggage Car Pennsylvania RR from Bachmann. This is the N Scale Heavyweight Observation - Ready to Run - Canadian National from Model Power. Suitable for Ages 14 & Older. This is the N Scale 72' Smooth-Side Baggage Car Norfolk & Western from Bachmann. This is the N Scale 85' Smooth-Side Coach w/Interior Lighting Union Pacific from Bachmann. This is the N Scale Heavyweight Observation - Ready to Run - Southern from Model Power. Suitable for Ages 14 & Older. This is the N Scale 85' Smooth-Side Observation w/Interior Light Norfolk & Western from Bachmann. This is the N Scale Union Pacific 72' Heavyweight Coach with Lighted Interior (#1115) from the Bachmann. Suitable for Ages 14 & Older.